Today is the day. The day I am going to do it. Today, I am going to try my hardest not to feel guilty, not to feel bad, not to feel stressed. Today, I am announcing the first break I’ve officially taken in over 5 years of blogging my ideas and inspiration boards for weddings, parties, celebrations, soirees, and holidays. Did you know that before I started Unique Pastiche Events, I was blogging on my other blog, A Sparkly Life for Me (formerly The Sparkle Queen)? I was! That’s where all of this all began, with The Sparkle Queen: Events. After creating a number of themed event decor boards, I knew I wanted to be blogging my ideas weekly, and thus the beginning of Unique Pastiche Events. Since starting this site back in 2013, I have been posting themed party ideas every week. EVERY WEEK. That’s a lot of ideas! And as much as I love doing it, sharing all the ideas, posting links to talented designers and creatives from around the globe, I need a break. I am fortunate to have a job in the events industry where I can design creative and unique events for my clients. I am also lucky to have found a new spark of passion and inspiration in my DIY blogging during my 2017 tablescaping challenge. At least twice a month I’ve been sharing tablescapes and table decor for your home, based largely on DIY elements (which I share video tutorials for), as well as items I find at the thrift stores, clearance sections, tag sales – you name it! My goal is to help generate some amazing tablescapes that are Pinterest worthy, in the comfort of my own home, without breaking the bank! This new chapter in my blogging timeline has really captivated my attention, and I see myself diving into more in the future as time allows. I know I can create some wonderful designs with a bit more time and energy able to be devoted to these creations. So with that being said, I hope you check out my site and see what I’m creating this month for my tablescaping challenge. In the meantime, I’m going to be taking a break from my weekly posts here at Unique Pastiche Events. When I’m ready to come back and dive into sharing ideas and concept boards, I will. Who knows, maybe I’ll post now and again as inspiration comes to me. But for now, I want to divert all my extra time outside of work and life, to developing more video DIY tutorials and tablescapes to help bring a little sparkle and joy into our homes and lives. I hope you join me on my next adventure! This is getting out of control! A few weeks ago I shared an inspiration board on a fun, vintage feeling classic cars party. A few weeks before that, a party inspired by a mechanics garage. This week? A high end – race to the finish line racing inspired reception ideas. Will this trend end? I don’t know! Part of it, or at least part of what I’m chalking it up to, is Pinterest’s ability to integrate things you have searched for into your feed, because you’ve clearly shown interest in it. Maybe all these ideas have been subconsciously making me want to keep curating car themed parties? I suppose we will never know. Don’t worry, I’ve been pinning all of my favorite classic car, race car, monster truck, NASCAR party ideas all on THIS board. For this “race to the finish line” party ideas board, I really wanted to keep it modern and more traditional racing, which is why you see lots of red with the classic white and black checkers. To keep it feeling modern, I made sure the lounge groupings and furniture set ups had that nice clean look with the texture in the metal, with a pretty sweet metal bar. Pick your favorite: classic car, mechanic’s garage, or race car themed party! 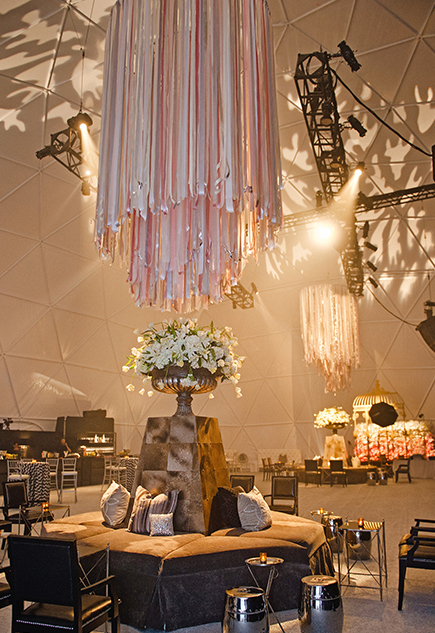 A fantastical feast awaits those who attend this midsummer night’s gala! All the stops are brought out for this magical evening. Lush greenery and twinkling lights are at every corner with wrapping vines and warm glowing hues spilling out from the corners and shadows. This enchanted midsummer night’s gala event decor ideas board has a little touch of modern influence to it. The shape and set up of the food display lends itself to trends of today, while the indoor garden lawn lounge allows guests to feel as if they are wandering through a magical forest. Galas, parties, fundraisers, and even weddings with high guest counts will be the type of events that really make this concept shine. With a high guest count, more space is needed to accommodate those guests, and with that extra space allows for these cohesive, yet distinct separate spaces. A vine covered dining space, a lush lawn for mingling and lounging, and even a quite garden space with a few acoustic musicians. The key to a successful midsummer night’s gala is the decor, and making sure lots of fresh greenery and florals of all sorts of shapes and textures are incorporated. What do you think of all this greenery? Do you think it needs some pops of color with flowers, or is the greenery enough?